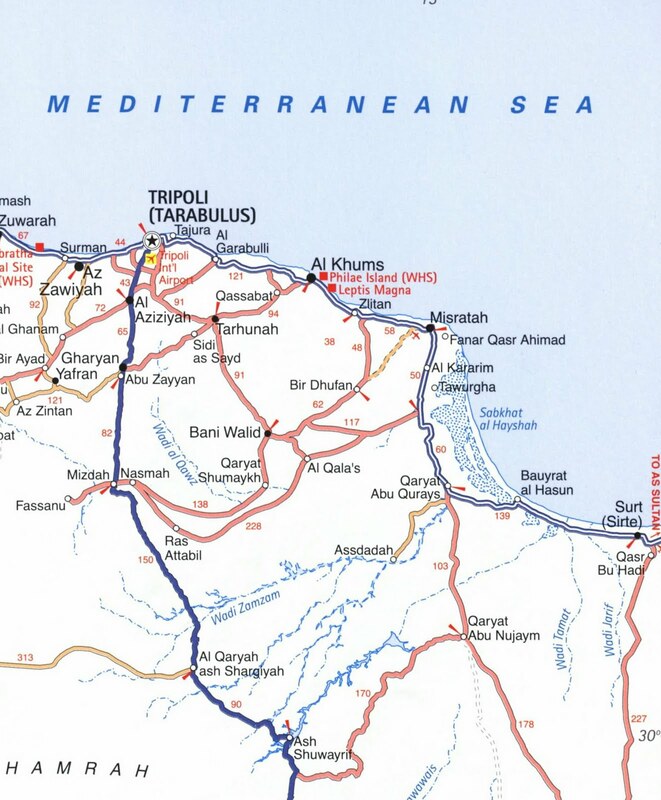 The Ball State University Libraries’ GIS Research and Map Collection (GRMC) on the second floor of Bracken Library houses a large collection of historic and modern maps of Libya, including maps of the capital city of Tripoli. The Atlas Collection also includes resources of Africa and the Sahara region including Libya. The maps shown above are available in the GRMC. 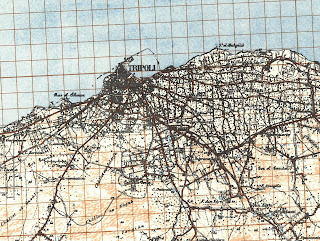 The topographic map of the region of Tripoli (click to enlarge) was published by the Army Map Service in 1942 during World War II. 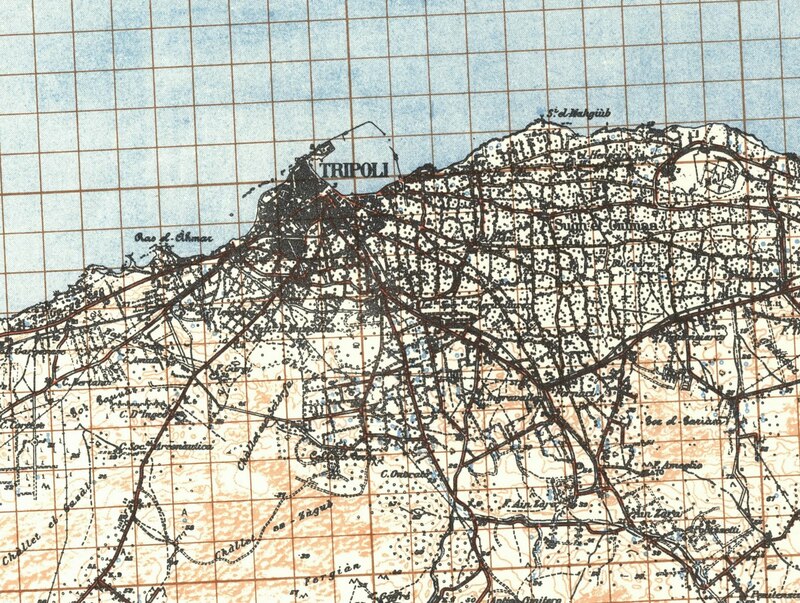 The street map of Tripoli (Tarabulus) displays green spaces in the coastal city. 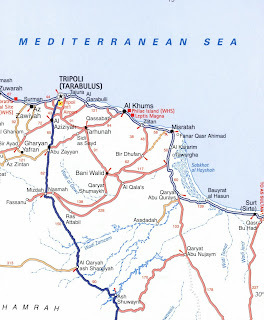 The map of the region between Tripoli and Surt along the coast is from the National Geographic Africa Adventure Atlas. Tripoli is described as a tourist destination in the 2008 atlas: A thoroughly modern city, with tall contemporary structures, a well-planned infrastructure and latter-day tourist traps, the old section was built on the original site of ancient Oea….The most impressive mosque in the city is the stately Karamanli Mosque off Green Square which, in turn, is guarded over by the most recognized landmark in Tripoli: the Old Castle—known locally as Assai al Hamra—overlooking both the harbor front and the ancient medina….As long as you observe the traditions and customs of the locals and reserve judgment on the political situation, it may prove to be one of the safest and most enjoyable destinations in North Africa. For more information about these maps and atlases, please contact the GRMC at 765-285-1097 Monday through Friday from 8:00 to 5:00 P.M.